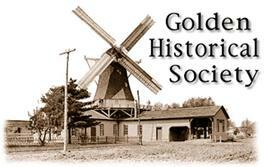 The Prairie Mills Windmill and the Golden Museum are open for tours on weekends beginning from Memorial Day weekend through Labor Day weekend. we welcome and appreciate any contributions. We welcome tours at other times by appointment. Several GHS members live nearby and can provide a tour with little notice, schedule permitting. Please contact us in advance to schedule tours for all groups over 10 people. We also offer tour/lunch combinations for large groups. We’ll give individual tours by chance if a board member is present and time permits.